How is Vladimir Putin different from Ronald Reagan? The Mideast peace process would never succeed because Jews and Arabs would re-fight the genocidal 1948 war that followed the partitioning of Palestine and the creation of the state of Israel, and this war would expand into a secular (Sunni vs Shia) and ethnic war that would encompass the entire Mideast. In the coming Clash of Civilizations world war, Iran and Russia would be our allies, along with India, versus the Sunni Arab countries, along with Pakistan and China. In the past year, I've been emphasizing that there is no Muslim vs Christian war going on, but there is a large and growing Muslim vs Muslim war, with the entire Mideast descending into war. 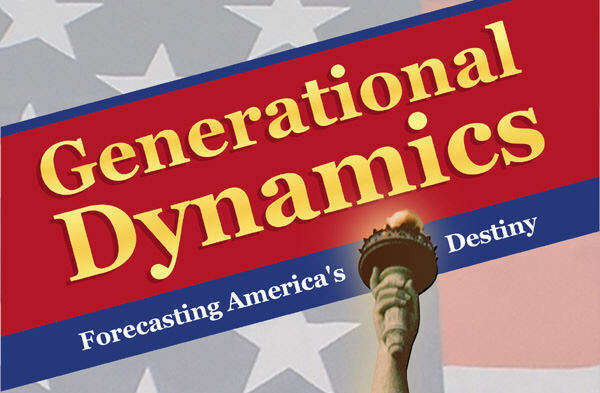 Many of these predictions are well over ten years old, based on generational analyses available at the time. Just to take one example, one way (of several) that I knew ten years ago that Iran would become our ally is that in the early 2000s, Iranian college students were having large pro-American demonstrations. Today, those college students are 30-40 years old, moving into positions of power, and changing Iran's politics, waiting for the survivors of the 1979 Great Islamic Revolution to die off. In the last few days it's become clear that Russia is in the midst of a massive, aggressive military injection of weapons and ground troops into Syria, and that Russia's forces will fight alongside those of the regime of Syria's president Bashar al-Assad, fighting (and exterminating) Sunni populations, whether the populations are linked to the so-called Islamic State (IS or ISIS or ISIL or Daesh), or linked to Jabhat al-Nusra (al-Nusra Front), or whether they're simply ordinary, innocent men, women and children. It's hard to overestimate the significance of this development, and how it will move the above list of war scenarios forward by quite a bit. Saudi Arabia and other Sunni Arab countries already consider Iran to be an existential threat, especially now that Iran has signed a nuclear deal with the West and stands to receive something like $100 billion per year in new revenue from the lifting of sanctions. Bashar al-Assad is also a hated enemy, because of his genocidal campaign against Sunni Muslims. A powerful military alliance of Russia, al-Assad and Iran, right next door to Saudi Arabia, is going to inflame sectarian tensions enormously. As I wrote yesterday in "12-Sep-15 World View -- Saudi Arabia's Grand Mosque, site of huge construction accident, has links to 9/11", the 9/11 fuse was lit by events that occurred in 1979, particularly the Soviet invasion of Afghanistan, which was viewed by the Salafists in Saudi Arabia as a an invasion by a mostly Christian army into a Muslim country. The Saudi Salafists will now portray Russia's action as a new mostly Christian invasion of the Mideast, which will further inflame jihadists. So far, the wars in the Mideast have been Muslim versus Muslim, but now there will be a big Muslim versus Christian component. Turkey is already involved in two wars -- one against ISIS in northern Syria, and one against the the Kurdistan Workers� Party (PKK) in southeast Turkey and northern Iraq. Turkey has invoked Nato article 4, with its 'territorial integrity and security' threatened, and the West is bound by treaty to support Turkey, not Russia. And as we described in "26-Jul-15 World View -- Turkey bombs ISIS targets in northern Syria to set up 'safe zone'", Turkey has set as a major objective to prevent large Kurdish enclaves in northeastern Syria and northwestern Syria from joining together by controlling the region between them. The Russian army will recapture that region for al-Assad, and may allow the Kurdish enclaves to link up. World War II was not a generational crisis war for either Russia or Turkey. For both countries, the last two generational crisis wars were World War I and the Crimean War, and Russia and Turkey were bitter genocidal enemies in both wars. They will be bitter genocidal enemies in the next war. As we described two days ago in "11-Sep-15 World View -- Russia, Iran sending troops to Syria as chemical weapons use grows", Putin's plan is to form a broad international coalition to support the al-Bashar regime, but nominally to fight ISIS. The coalition would unite Syrian forces, Russian forces, Iranian forces and Western forces, and would receive a mandate from the United Nations Security Council. I would like to say that there isn't a snowflake's chance in hell that the Obama administration would go along with this disastrous plan, but after what we've seen in the administration's willingness to bend over backwards to accommodate the demands of Russia and Iran in other areas, we really can't count on anything. Russia opened the dialog on Friday with a call for military-to-military cooperation between the Russians and Americans in Syria, in order to avoid "unintended incidents." The message seems to be pretty clear that Russia is planning to take control of Syria's airspace, and possibly Iraq's as well, and that American and Israeli warplanes will be forced to stay out. President Obama issued a hard-hitting warning to Russia on Friday, saying, "But we are going to be engaging Russia to let them know that you can't continue to double-down on a strategy that is doomed to failure." To stabilize Bashar al-Assad's regime. The Syrian army has been losing battle after battle, and al-Assad's Damascus regime was close to collapse. The arrival of thousands of Russian and Iranian troops will turn that around. Creation of a new mobile Iranian "buffer force," with the special task of rushing to any military front in trouble. Targeting North Caucasian and Chechen extremists in Syria. It's estimated that about 1,500 Russian citizens -- from Chechnya, Dagestan, and other North Caucasian provinces -- are currently fighting with Syrian opposition groups, and are believed to be largest contingent of foreigners fighting in the Syrian civil war. Since any anti-Assad rebel group may contain fighters from Chechnya and the Caucasus, this objective gives Russia soldiers blanket license to attack any Syrian citizens, including innocent civilians. Target Syria's northern front, especially Aleppo and Idlib province, where al-Assad has suffered major defeats recently. "How is Russia's president Vladimir Putin supporting Syria's Bashar al-Assad different than Ronald Reagan supporting Iraq's Saddam Hussein in the 1980s [in the Iran-Iraq war]? Both of them were extremely brutal and committed horrific atrocities, with the protection of a superpower allowing them to get away with anything they wanted. Saddam could match Assad, perhaps even exceed him in brutality." It's an interesting question, but I think that there are differences. We might as well start with our alliance with Josef Stalin's Russia in WW II. Stalin had killed millions of people brutally, including millions of people by starvation in Ukraine. But we allied with Stalin because he was the lesser of two evils. 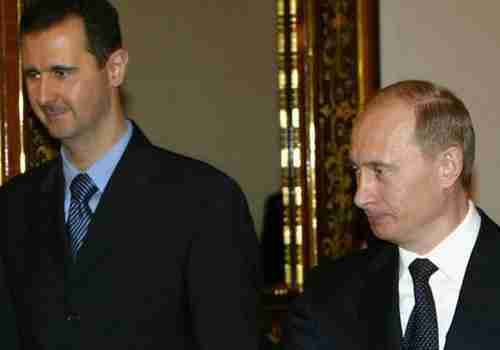 Russia is using the same argument -- that al-Assad is the lesser of two evils, the other evil being ISIS. The problem with Russia's argument is that ISIS didn't exist when Russia began supporting al-Assad. Let's review what happened: Bashar al-Assad has killed tens of thousands of innocent Sunni women and children using Russia's heavy weapons, he's killed children by sending missiles into exam rooms and bedrooms. He's used Sarin gas against his own people, and he's killed countless more with barrel bombs loaded with explosives, metals, and chlorine gas. In addition, he's used electrocution, eye-gouging, strangulation, starvation, and beating on tens of thousands of prisoners on a massive "industrial strength" scale, and does so with complete impunity, and has been doing so for many years. That's good enough for me to call him a psychopathic genocidal monster and a war criminal. Vladimir Putin and Iran's Ayatollah Khamenei are also war criminals because they're supplying weapons to al-Assad to commit genocide. The actions of these three war criminals drew jihadists to Syria from all over the world, resulting in the creation of ISIS, and resulting in over 11 million Syrian refugees, hundreds of thousands of which are now flooding into Europe, creating a refugee crisis comparable to WW II. And the suffering of these millions of Syrian refugees is of no consequence to Syria, Russia or Iran. In fact, my guess is that Vladimir Putin, Bashar al-Assad and Iran's Ayatollah Seyed Ali Khamenei are all rubbing their hands with glee over the suffering they've caused, because it distracts the West from their military actions. So Russia's argument that it's only supporting the "lesser evil" is not valid because when Russia began supporting al-Assad, the other "evil" was peacefully protesting innocent men, women and children. Putin and al-Assad took steps that created ISIS, the "other evil," and now they're justifying their actions by saying that they have to fight the evil that they're responsible for. It's almost impossible to believe how much damage these three war criminals have done to the world, with complete impunity. If this kind of disaster had been predicted five years ago, no one would have believed it. At least it makes it easier for us to understand how Hitler got away with it for so long.